Beef Flavour Bouillon Powder Mix. Salt, potato starch, maltodextrin, yeast extract, flavourings, palm fat, sugar, beef extract (2.2%), acid (succinic acid). May contain gluten, milk, egg, celery and mustard. 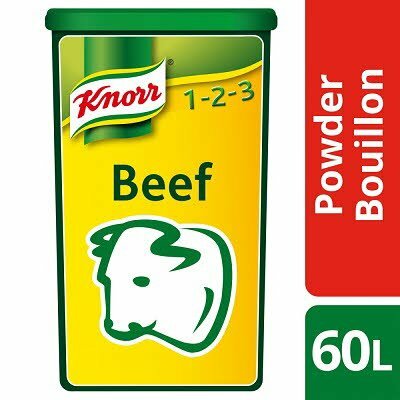 Add Knorr Beef Bouillon Powder to boiling water and stir until dissolved. 20g per 1 litre of water. Entire pack with 60 litres of water.